I expect this book to be a contender for the Governor General picture book award this year. It exemplifies the perfect marriage between words, image, and graphic layout. It is both informative and engaging. 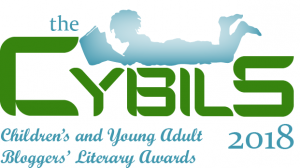 I read it at least three times and after each reading, my heart was inundated with wonder, awe and fear. Each time I pick it up, I am again breathlessly enthralled. 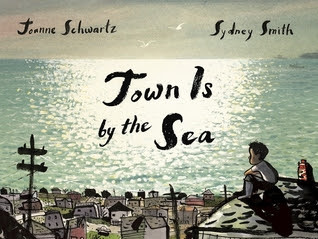 Schwartz' prose tells the story of a day in the life of a young boy whose father works under the sea as a coal miner. 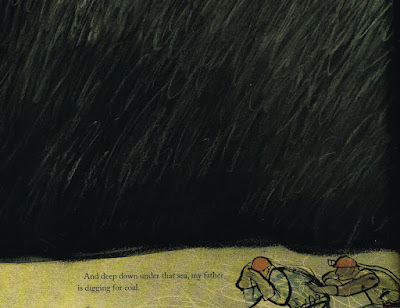 His day is partitioned into sections that begin with the refrain, "This is how it is," and end with a vista of the sea and in the next illustration, the words, "And deep down under the sea, my father is digging for coal." I was overwhelmed by the beauty and detail of these watercolour and ink illustrations. There is stark contrast between the light and open space of the carefree summer day and the dark ominous place where the boy's father and other miners work underground. These pages, streaked in black, show the miners working at the bottom. While danger is never mentioned in the text, Smith's illustrations depict it clearly. There is an ambience of timelessness to this story. At the same time as it takes us through the cycle of a young boy's day, it hints at cycles of years and when the boy visits his grandfather's grave, cycles of life. This historical picture book provides for a window into the past to a time and way of life that if it hasn't already disappeared, it probably soon will be. It is set here in Canada in Cape Breton, but the universal story of a coal mining town could be from anywhere. The back matter contains additional information about the culture of mining villages across the world.